"Good things come to those who wait." This common English phrase, which extols the virtue of patience, speaks volumes in regards to success, particularly when it comes to the fashion industry. To pay homage to the lost art of waiting, Le Souk has ransacked the archives to find five designer 'rags to riches' stories that are sure to inspire. The king of Polo, Ralph Lauren, was born Ralph Lifshitz in the Bronx, New York to a middle class Jewish family. Lauren finished school and served in the army before deciding he wanted to become a tie salesman for Brooks Brothers. It was the sixties and aged 26, he saw a gap for wide neckties (when most brands were only doing skinny versions). Lauren began making his own ties and selling them to friends – his small success prompting him to leave his job and join smaller necktie manufacturer, Beau Brummell. Encouraged by Brummell to go out on his own, Lauren went from retailer to retailer selling his product. Finally, he was approached by retailer Neiman Marcus, which ended up purchasing 1200 units. With the financial support of clothing manufacturer Norman Hilton, Lauren opened his own necktie store under the name Polo. The self-made American surged in popular with launch of sporty collared shirts - the ‘Polo’ - made from exquisite cotton. Today, the Polo Ralph Lauren brand has a net worth of $7bn, oversees several other brands (Ralph Lauren Black Label, Ralph Lauren Purple Label, Ralph Lauren Blue Label, Lauren Ralph Lauren, Club Monaco and Chaps), and boasts 388 global stores. Click here to read more about history of Polo Ralph Lauren. Lee Alexander McQueen was born in London, England to a taxi driver and social science teacher. McQueen would design dresses for his sisters as a child, before leaving school at 16 to work for tailors, Anderson & Sheppard. The young McQueen then joined British tailors Gieves & Hawkes on London's Savile Row, where he carved out a reputation for producing impeccably tailored garments for clients such as Prince Charles. In 1994, McQueen applied to work as a pattern cutter tutor at the Central Saint Martins College of Art and Design, but was instead advised to enrol as a student. McQueen earned his masters degree and had his entire graduation collection purchased by fashion stylist, Isabella Blow, who told McQueen to go by Alexander instead of Lee when he launched his fashion brand. McQueen went on to stage unconventional runway shows and became known for his skull-printed chiffon scarf made in the mid-2000s. As head designer, McQueen was awarded the title "British Designer of the Year" four times between 1996 and 2003 and was also awarded the CBE. McQueen was also creative director at Givenchy, where he served from 1996 to 2001. In December 2000, the Gucci Group acquired 51% of his company and appointed him as Creative Director before launching stores in London, Milan, New York, Los Angeles and Las Vegas. Finally, in 2003, he was named International Designer of the Year by the Council of Fashion Designers. Sadly, McQueen took his own life in 2010. Elie Tahari was born in Jerusalem in 1952. Tahari moved back and forth from Israel to Iran before settling back in Israel as a child. His parents were then divorced, and his father remarried, Tahari moved around in Israel as he was sent to an orphanage. When he finally immigrated to New York in 1971, he had less than $100 with him and slept on park benches in Central Park before getting a job at a boutique in Greenwich Village as an electrician. Tahari started to create his own dresses in swishy 70s style in liquid silk, which proved to be so popular that he had to open a store in 1974. Elie Tahari opened its doors on Madison Avenue and became of one of the first designers to arrive on the famous strip. In 1997, Tahari and his former business partner, Andrew Rosen, co-founded the Theory fashion brand. Tahari sold his share in 2003. Today, Tahari’s company has an estimated net worth of over $500m. Gabrielle Bonheur (“Happiness”) Chanel is a French fashion designer. Chanel was born in 1883 in Saumur, France to unmarried parents. At 12, her mother died of bronchitis and her father sent her and her sisters to the convent of Aubazine. 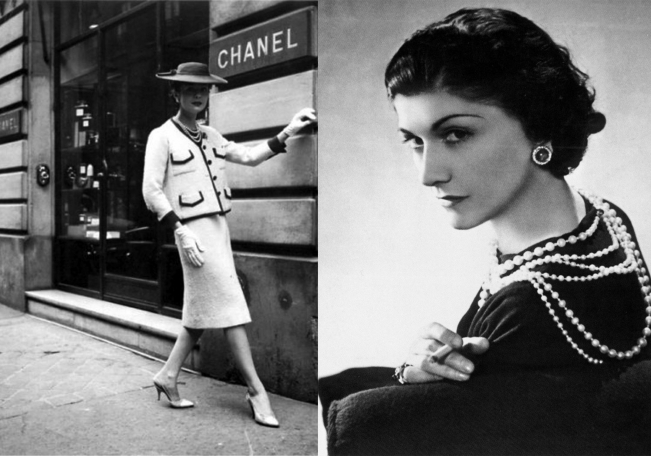 However, during her time there, Chanel learned how to sew and began working as a seamstress. Craving grandeur, Chanel would moonlight as a singer and made her singing debut at “La Rotonde”, giving her the nickname Coco because of the songs she chose. In 1906, Chanel failed to make it as a singer and fell back on her trade as seamstress, joining Etienne Balsan. Through a love affair with Balsan, Chanel became a licensed milliner before meeting Captain Arthur Edward “Boy” Capel, who became her true lover, financing Chanel’s first shops. Chanel garnered a reputation for her classic tweed suits and little black dress, before branching out into accessories and fragrance. Coco Chanel died in 1971. In 1999, she was the only fashion designer to be listed on Time’s 100 Most Influential People of the 20th Century. As of 2013, the Chanel brand has an estimated net worth of $7bn dollars. Thierry Hermes was born in Krefeld, Germany in 1801. Part French, he ended up moving to France in 1821, following the death of his entire family. In 1837, he established a leather workshop in Paris that was dedicated to serving European nobleman, selling some of the finest wrought harnesses and bridles for the carriage trade. In 1880, his son Charles-Èmile Hermés took over the shop, introducing leather saddler items into the shop, which attracted new clientele. In 1900, with his sons Adolphe and Émile-Maurice Hermès, the firm offered the Haut à Courroies bag, specially designed for riders to carry their saddles with them. In 1922, Charles-Èmile’s wife reportedly complained she couldn’t find a decent handbag in Paris, which lead to the son of the original Hermés launching a handbag range. This lead to the designing of the classic Birkin bag. In 1929, the first women's couture apparel collection was previewed in Paris. In 1935, the leather Sac à dépêches (later renamed the "Kelly bag" after Grace Kelly) was introduced, and, in 1937, the Hermès carrés (scarves) were introduced. In 1949, the same year as the launch of the Hermès silk tie, the first perfume, Eau d'Hermès, was produced. As of 2010, revenue from the Hermés company was at $3bn.